Know About 9 Most Popular Festivals in Himalayan Region! 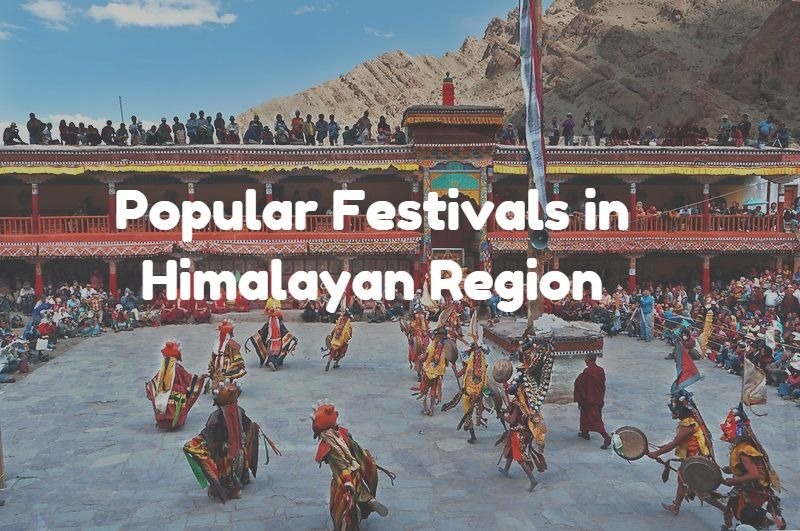 Home Travel News | Travel Guides Know About 9 Most Popular Festivals in Himalayan Region! There are scores of popular festivals in Himalayan region which have, for long, fascinated people all over the country and the world! The Himalayan region of India remains a unique attraction owing to its rich cultural diversity, endangered wildlife, sprawling biodiversity, and picturesque landscape. The remarkable festivals of Himalayan region have only added to the rich attraction of the place. If you wish to know more about the indigenous tribes that reside here and their culture, visit and be a part of some of the festivals celebrated in Himalayan region. Epitomizing the unique and fascinating lifestyle of Himalayas, the festivals of northern plains are immensely interesting to know about. They are an important part of the fascinating things about India not many are aware of. Of the vast number of these popular festivals in Himalayan region, we’ve listed a few important ones you can consider being a part of on your trip to India. A two-day celebratory event, the Hemis festival is held each year in June or July at the Hemis Monastery. One of the important festivals of northern India, it is dedicated to Lord Padmasambhava. The festival comprises an eccentric and colorful masked dance performance depicting the victory of good over evil. Wearing colorful masks, vibrant costumes, and moving hypnotically to the sound of cymbals, trumpets, and drums, the dancers enthrall onlookers. Held from December 24 to 26 in Pelling, Khangchendzonga Tourist Festival is one of the most popular festivals in Himalayan region. Boosting tourism in Sikkim, this wonderful occasion involves adventurous and fun events such as white water rafting, trekking, mountain biking, and kayaking among others. Also, there are flower exhibitions held during the festival. You can also try traditional local food such as Thukpa, Momos, and Kinema. One of the most entertaining festivals of north India, the Naro Nasjo Festival is held in August every year when the Guru Neropa flower blooms. Held at the Sani Monastery in Zanskar, the festival comprises the Bardan Monastery Lamas performing a mesmerizing masked dance besides unveiling the statue of Naropa. Board a few last minute flights in case you cannot book in advance and come to be a part of this spellbinding festival. Representing the complex philosophies, practices, and teachings of Tibetan Buddhism, the Kalachakra Festival held in July is among the most interesting of all Himalayan festivals. The festival depicts the Kalachakra within the mystifying Tantric Buddhism revolving around the concept of cycles and time. The Dalai Lama addresses his devotees during this festival while the Namgyal Monastery monks conduct a variety of performances which include the Kalachakra Ritual Dance. This is among the most popular festivals in Himalayan region you can attend when arriving on economy or business class flights. Held sometime in January or February and spanning about 15 days, Losar Festival symbolizes the Tibetan New Year. One of the most fascinating festivals celebrated in mountain region, it is characterized by stunning masked dances, hypnotic music, and mouthwatering food among other things. Also called Ziarats, Urs is an 11-day annual event held on the death anniversaries of Muslim saints. The death of a Muslim saint is celebrated akin to a wedding anniversary. During this time, scores of devotees throng the shrine to pray as a cleric displays a relic of the saint. Captivating performances of the Sufi devotional music form Qawwali are held at this time. One of the most popular festivals in Himalayan region, Urs is both, a time to joy and grief, for devotees of the deceased saint. Celebrated each year on the 1st of September, Solung is one of the most important festivals of Arunachal Pradesh. Primarily an agro-based festival, there are three main parts to it – the Limir-Libom (the sacrificial day), Binnyat (offering to Kine Nane, the Goddess of crops), and Ekop or Taktor (a ritual to appease Doying Bote and Gumin-Soyin). You can explore the stunning beauty of Arunachal Pradesh in addition to attending the Solung Festival. Held in mid-March, this is one of the popular festivals in Himalayan region wherein most of the ceremonies are conducted by young girls. One of the major festivals of north India, it is held month-long in some places. During this time, young girls visit the homes of those in their locality with plates full of coconut, rice, flowers, jaggery, and green leaves. They pray blessings of prosperity upon the houses they visit and are given gifts in return. Like the others on the list, this is one of the major festivals in the Himalayan region you can be a part of when arriving to the country on cheap flights.